Circadian clock proteins KaiA (top), KaiC (center) and KaiB (bottom). Molecular processes occur so fast that is it difficult to imagine a 24-hour clock that works at the molecular level. But surprisingly, different organisms have evolved many different ways of doing this. Animal cells use a complex collection of proteins (with fanciful names like Clock, Cryptochrome, and Period) that are rhythmically synthesized and degraded each day. The 24-hour oscillation of the levels of these proteins is controlled by a series of interconnected feedback loops, where the levels of the proteins precisely regulate their own production. A much simpler system has been discovered in cyanobacteria. It is composed of three proteins, KaiA, KaiB and KaiC, that together form a circadian clock. At the beginning of the cycle, KaiA (at the top, PDB entry 1r8j ) stimulates the large KaiC hexamer (center, PDB entry 2gbl ), which then adds phosphate groups to itself. Then, as KaiC fills itself up with phosphates, it binds to KaiB (bottom, PDB entry 1r5p ), which inactivates KaiA and allows the phosphates to be slowly removed. As the number of phosphates drops, KaiB falls off and KaiA can start the cycle again. 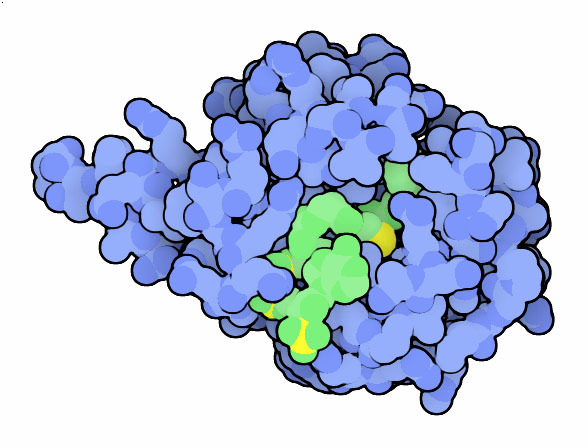 Serotonin N-acetyltransferase, with an analogue of the substrate (green) bound in the active site. The small hormone melatonin is produced selectively at night, and circulates through the blood to coordinate our nightly activities, such as sleep. Treatment with melatonin may be used to change this cycle artificially, for instance helping to shift cycles that are out of phase during jet lag. The daily rise and fall of melatonin is caused by changes in the levels of the enzyme serotonin N-acetyltransferase, shown here from PDB entry 1cjw . This enzyme adds a few atoms to the neurotransmitter serotonin, then a second enzyme converts it into melatonin. In this structure, the enzyme is caught in the process of performing the reaction--the large green molecule bound in the active site is similar to the intermediate formed as the acetyl group is added to serotonin. The KaiC clock protein (PDB entry 2gbl ) is composed of six identical subunits that form a barrel-shaped structure. 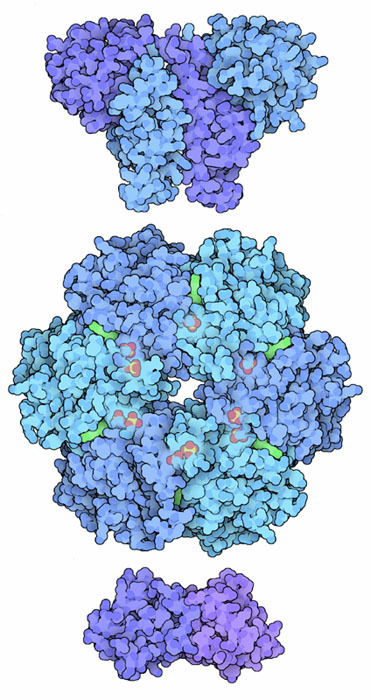 The protein is shown from side here, with two subunits removed to show the tunnel that runs through the middle. The phosphates that tick off the hours of each day are added to a serine and a threonine on each subunit. 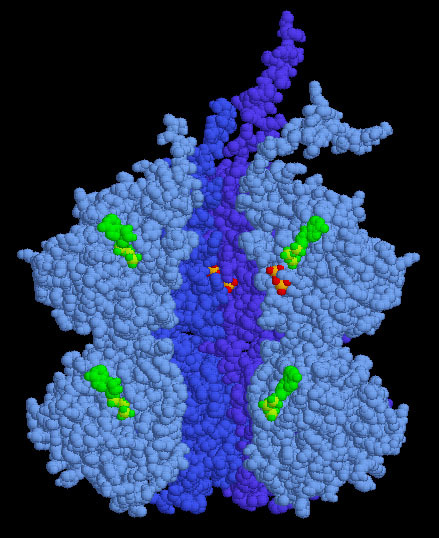 They are buried deep inside the tunnel, near the binding site for ATP, shown here in green. KaiA stimulates KaiC to add these phosphate groups to itself, and KaiB blocks the action of KaiA, allowing KaiC to remove these phosphates from itself. The speed of these reactions are all calibrated so that the whole process takes 24 hours to complete. To explore this structure in more detail, click on the image for an interactive JSmol. M. J. Rust, J. S. Markson, W. S. Lane, D. S. Fisher and E. K O'Shea. (2007) Ordered phosphorylation governs oscillation of a three-protein circadian clock. Science 318, 809-812. J. Arendt and D. J. Skene (2005) Melatonin as a chronobiotic. Sleep Medicine Reviews 9, 25-39. D. Bell-Pedersen, V. M. Cassone, D. J. earnest, S. S. Golden, P. E. Hardin, T. L. Thomas and M. J. Zoran (2005) Circadian rhythms from multiple oscillators: lessons from diverse organisms. Nature Reviews Genetics 6, 544-556. S. L. Harmer, S. Panda and S. A. Kay (2001) Molecular bases of circadian rhythms. Annual Review of Cell and Developmental Biology 17, 215-253.